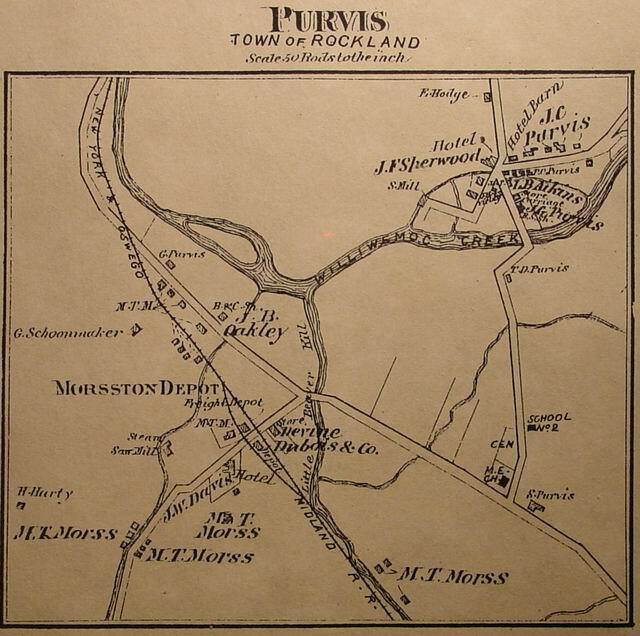 Which road went through Purvis first - the road that crosses the Willowemoc by the school or the road that went through Motts flats and through the covered bridge. Both places had a covered bridge at one time but certainly in the early days there wouldn't have been two bridges within a mile of each other. Logically the bridge in town would be first but if Motts was one of the early families to come to the area why wasn't the road through his area first. 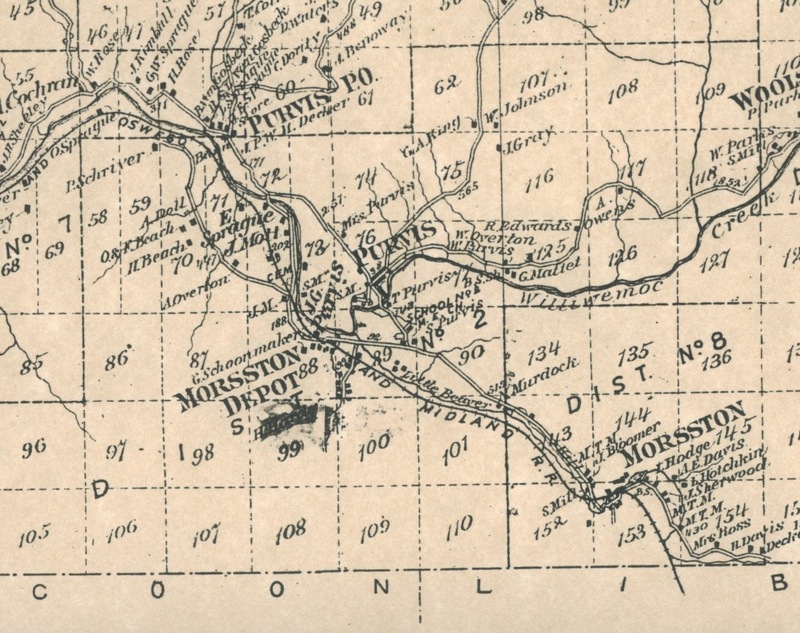 Purvis PO (Deckertown) and Morsston seemed to be more populated than Purvis in 1875. Was the railroad the death of both. Why did nobody settle on Mussman flats. It was level and seemed ideal for development. 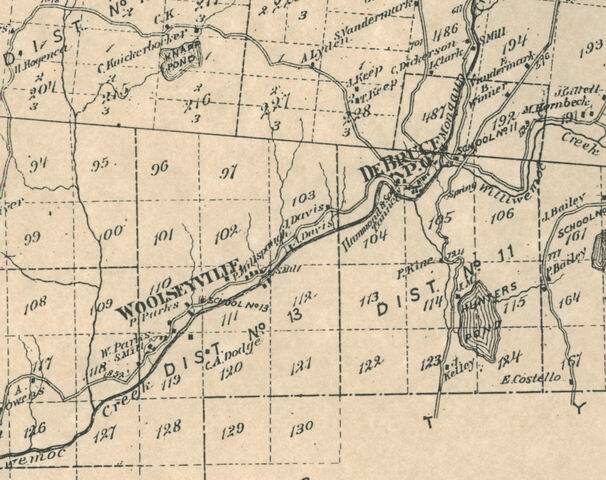 Before 1870, the DeBruce road probably went only as far as W Purvis and W. Overton farms which were near the old Hollywood Hotel and below Dave Seeley's farm. That would explain why there are no houses shown until Woolseyville (Parkston). 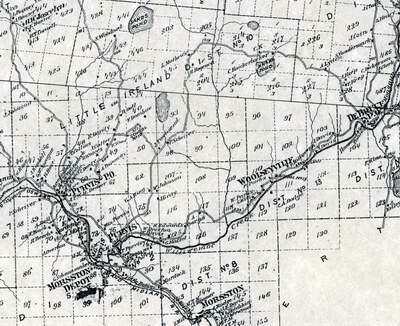 Before 1870, to go to DeBruce the road was up WhiteRoe Hill crossing through Grooville and down into DeBruce. This was also the same way that they got to Neversink and Kingston in the very early days even before the Hunter Road. 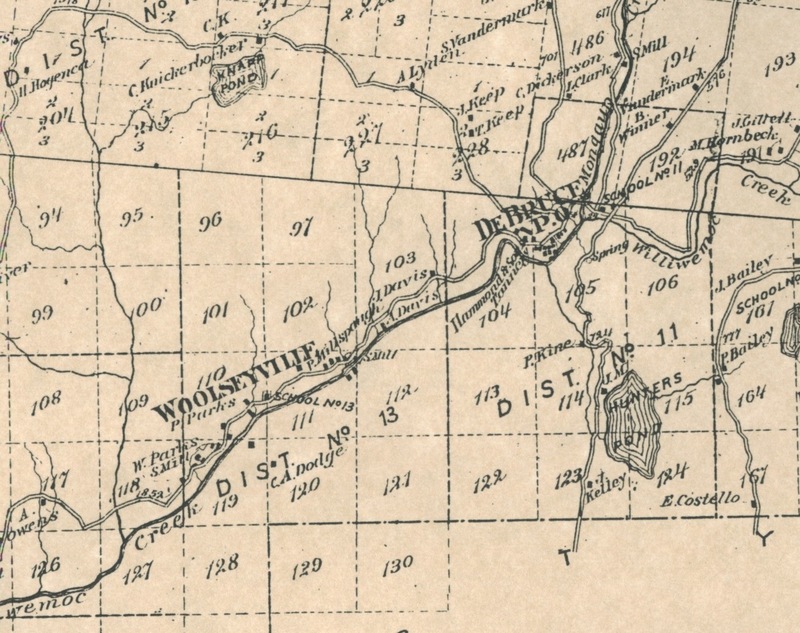 The first road to Woolseyville (Parkston) was by way of DeBruce since that was a well traveled road to the tannery in DeBruce from Parksville in the 1850's through the Civil War. 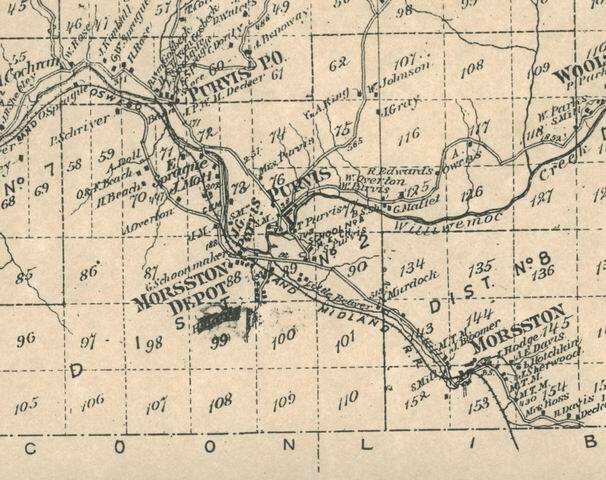 I suspect that the road was built from Woolseyville to Purvis after the railroad came to town and they no longer floated lumber down the river to the Delaware but sent it by train. After the Yahoo discussions about Little Ireland (see below) and a couple of questions from others that are following the group as to "where was Little Ireland" I thought I would get the 1875 Beers map out and put up the map where Little Ireland was. To my surprise the area was considerably larger than I thought. I always thought it was just the little valley up by the Body's and Woods where my Father was a member of the Little Ireland Hunting Club. There was a school district #10 that covered the area from Purvis PO (Deckertown), Grooville and almost to DeBruce. Maybe this why the census-taker took so long. Mrs A.R. Purvis, aged about 94 years. immigrants which gave the place its name." 3. Warm weather starts up here around July 12th. Fall begins on the 13th. living at Little Ireland at the time. Crippen has arrived from Pennsylvania. sons, or grandson now lives at the old Wood place. bridge that summer, but then, that's another story. of the 1870 census from the Town of Rockland. leads from Deckertown, currently the Don Fries place. television actor. Remember "Riverboat", anyone? head. 'Oooohh, I got to sit down and take a break.'........." clearings that these early settlers opened up for their small farms.